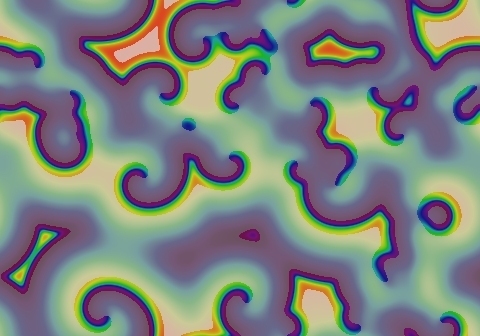 These images and movie demonstrate the behavior of the Gray-Scott reaction-diffusion system with σ=Du/Dv=2 and parameters F=0.0100, k=0.0350. Most starting patterns produce small blue spots and blobs on a red background, which grow with smooth outer edges and slowly decaying trailing edges, mostly annihilating each other as they fill the space. 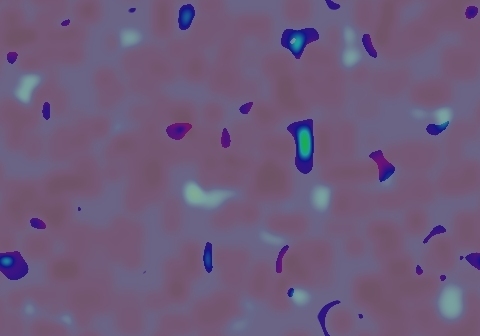 However, as seen here, a few second and third generation waves will arise, and some of these develop into spiral seeds which lead the transformation to a field of spirals similar to those in the B-Z (Belousov-Zhabotinsky) reaction. 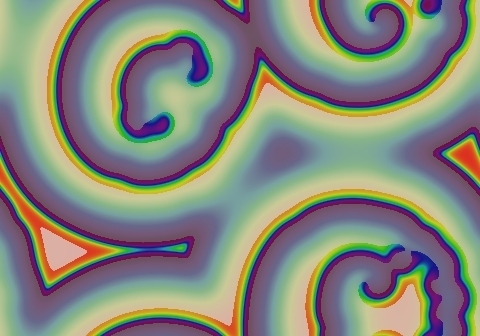 This pattern continued to produce spirals for at least 27,000,000 tu.